RIO de JANEIRO — In a shining example of why track and field has such problems, many of the sport’s own making, the men’s 200m prelims got underway Tuesday afternoon — before a nearly-empty house — with its biggest star, Usain Bolt, running at 12:46 p.m. in the ninth of 10 heats. Justin Gatlin ran about a half-hour before, four heats prior. Under what theory of marketing, salesmanship, promotion — more, relevance — are the No. 1 and No. 2 names in track and field slogging it out in the dog day afternoon? It’s halfway through the Rio 2016 Olympic meet. Track and field should be seizing its moments in the once-every-four-years spotlight. Instead, what we have is world-class buzzkill. The 2016 world indoor championships, in Portland, Oregon, in March, went off before a full house, a show full of music, lights and world-class competition. The 2012 Olympics in London were marked by full, rowdy crowds, day and night. At the outset: it’s no fun to assert that the track and field competition has serious issues, especially amid what should be an Olympic celebration. But if not now, when? By now, it’s well known that track’s worldwide governing body is confronting a range of extraordinary issues, among them a purported corruption scheme involving the former president tied to allegations of state-sponsored doping in Russia. If there ever should be a week when all of the sport’s big-picture issues could be brushed aside, this ought to be it — the Olympics. Track and field, for all its challenges, and there are many, holds enormous potential. It has long been the king of the modern Olympics and maybe still should be — the one sport that anyone anywhere can, and pretty much does, do, at least in some form. Run, jump, throw. Basic. Instead, this Rio meet finds itself bedeviled by a bevy of logistics, location, pricing and scheduling challenges, all of which surely have contributed to the sparse crowds. And then there remains the sport’s underlying presentation problem: doping. As in: can you believe what you see? All of that was encapsulated in Tuesday’s women’s long jump qualifying. The lone Russian allowed to compete here, Darya Klishina, jumped away. She was part of a field of 38, two groups of 19, that got cut to 12. Eighth, she passed through to the final. Why in the world go through such a ridiculous exercise — cutting 38 to 12? Same with the men’s high jump qualfiying on Sunday night — 44, two fields of 22, to 15, an event that Canada’s Derek Drouin won Tuesday night at 2.38 meters, or 7-9 3/4. All sports, especially Olympic sports, depend on stars and on stories. Swimming and gymnastics, which dominate the first week of the Games, have thrown off stars who have become household names: Michael Phelps, Katie Ledecky and Simone Biles, among them, Biles on Tuesday winning her fourth Rio gold medal, in the women’s floor exercise. Track and field, at these Olympics, seems determined to sabotage virtually every great story there might be. Christian Taylor is a threat to break the world record every time he competes in the triple jump. He and Will Claye went 1-2 in London, and on Tuesday they went 1-2 again. In a competition that started at 9:50 in the morning. Seriously — 9:50 in the morning. To say that the stadium was not full would be — generous. Afterward, Claye proposed to his girlfriend, the 2008 Olympian and hurdler Queen Harrison. Who saw any of this? In the heats Tuesday morning of the women’s 5000m, American Abbey D’Agostino and New Zealand's Nikki Hamblin tangled together, then fell. In a lovely moment of sportsmanship, D’Agostino then helped Hamblin up, and — painfully — each finished the race. As the Indianapolis Star would report, the moment drew attention from international journalists — reporters from eight countries waiting to talk to the athletes afterward. There are roughly 200 nations here in Rio. The men’s pole vault provided high drama: Brazil’s Thiago Braz da Silva won in an Olympic-record 6.03, or 19-9 1/4. Competition started Monday evening and ended after the clock said Tuesday morning. Granted, it rained Monday, hard, and there was a delay. Even so, if one of the key drivers of the Olympic movement is to draw young fans, how exactly does crowing a champion after midnight come anywhere near achieving that goal? Moreover, the American Sam Kendricks took bronze, behind da Silva and the great French champion, Renaud Lavillenie. Kendricks went to Ole Miss and is a U.S. Army reservist; that medal is the first for an American male in the Olympic pole vault in 12 years. The news conference following that pole vault competition? It started after 2 a.m. When what happened to Ryan Lochte is in the forefront of way too many minds and the bus schedule at night is irregular, at best: how many logically thinking reporters or news crews want to stick around for a bus that’s supposed to be there at the top of the hour, meaning 3 or 4 a.m. but, you know, may or may not be? The aftermath of the pole vault further illustrates the disconnect. The sparse crowd still left in the stadium had cheered boisterously for da Silva. After, Lavillenie said, "If this is a nation where they only want Brazil and they spit on others, then you should not organize the Olympics," he said. He also made a comparison to Hitler's 1936 Berlin Games -- which he then retracted and apologized. Even so, at Tuesday night's medal ceremony, Lavillenie got hit with a barrage of boos. It moved him to tears. This was too much for a great many people, among them the International Olympic Committee president, Thomas Bach, who called the boos "shocking," adding it was "unacceptable at the Olympics." Sunday night proved the one night the stadium was full — because of Bolt, of course. And it had the added electricity of a world record in the men’s 400m, from South Africa’s Wayde van Niekerk, who ran 43.03, taking down Michael Johnson’s 17-year-old mark, 43.18. But Sunday night also highlights the complexities that have made this meet so — unsettling. Even that men’s 100m final proved problematic. The two semifinals were run at 9 and 9:07 p.m., the final at 10:25. Both Bolt and Gatlin complained later that the time in between was just not enough. Part of the challenge here has centered on weather -- for instance, Monday’s rain. Part with location. At prior editions of the Games, track and field and the ceremonies, opening and closing, shared a stadium. Here, ceremonies are at Maracanã. 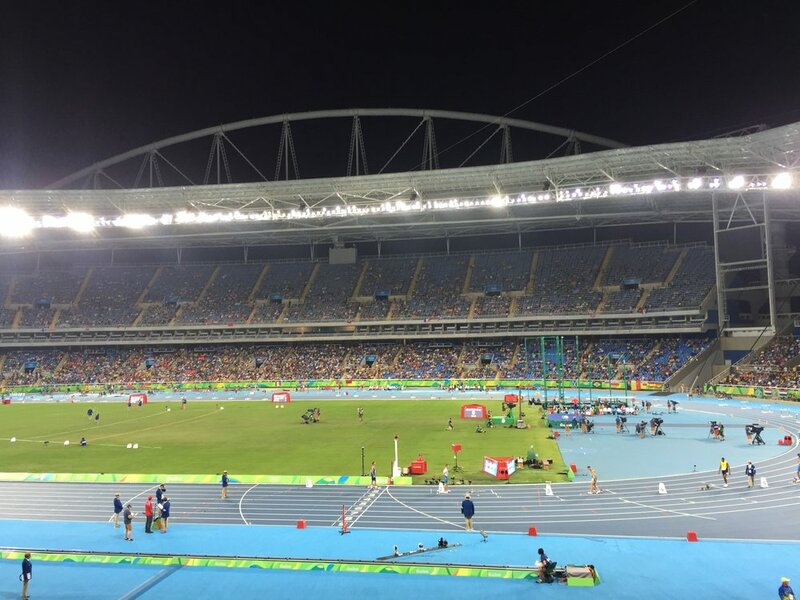 Track and field is taking place at Engenhao. Think Wrigley Field or Fenway Park in the middle of a dense urban neighborhood. Unlike those two baseball parks, however, Engenhao is super-difficult to get to and from — 90 minutes, typically, from Copacabana. Part, price. Tickets for Tuesday’s prelims ranged from $100 to $350, for the evening finals from $260 to $900. Part of the challenge, too, is simple scheduling. This Olympic meet runs for nine days. The U.S. nationals go for four. Six would be more than enough. There are lots of reasons - hello, ticket sales — to slice and dice the track and field schedule into this many days. But that isn’t happening. Outside of Sunday night, the crowds have been thin, at best. ”The IAAF's original timetable of April 2014 had evening sessions earlier and qualifications during the morning session. This was changed following requests from the local organizing committee Rio 2016 and broadcasting to have finals in the morning sessions and a later start in the evening for a combination of broadcast reasons and to help with ticket sales. We always want to work with organizers to produce schedules which meet their requirements and broadcast to reach global audiences. This is what we have tried to achieve in this case." The Tuesday morning session ran to 25 — 25! — events. The list: that men’s triple jump final, the women’s discus throw final (won by Croatia’s Sandra Perkovic), rounds for the women’s pole vault and heats of the women’s 5,000m, men’s 1500, men’s 200 and women’s 100 hurdles. The Tuesday evening affair included 19 different events, building toward the two key race finals, the women’s 1500m and the men’s 110m hurdles. Compare: last Thursday evening at the pool, when Phelps won the 200m individual medley and Simone Manuel the women’s 100m freestyle, there were all of 10 races, four of which were finals. The men’s 100m is often called the “dirtiest race in track.” This appellation goes back to at least 1988 and Ben Johnson. The women’s 1500 has historically proven way worse. In the London 2012 women’s 1500m final, for instance, six of the top nine have been linked to performance-enhancing drugs. After Sunday’s women’s 1500m semifinal, American Jenny Simpson spoke out about Ethiopia’s Genzebe Dibaba, the world record holder in the event. Dibaba’s manager, the Somali Jama Aden, was arrested two months ago in Spain on suspicion of possessing doping products. Authorities have not accused Dibaba of any wrongdoing and after the Tuesday final she declared, through a translator, that she was "completely and crystal clean from doping." Simpson finished third Tuesday night, in 4:10.53. She is the first American woman to medal in the 1500. “The 1500m is unbelievably hard,” Simpson said late Tuesday. “And I’ve chosen to take on a challenge that I didn’t know if I could do it. There are moments where I thought, ‘Why am I here? Running 1500m is so hard.’ To take a piece of history — I don’t know, I sat down with my coaches … in 2013, and I told them I wanted to leave a mark on this sport that everyone in America could be proud of. Kenya’s 22-year-old Faith Kipyegon, silver medalist behind Dibaba at last year’s world championships, won the race, in 4:08.92. The stadium was maybe one-quarter full.